Morgan Groenhoff knew she wanted to study dental assisting when she decided to attend NTC right after she graduated from high school. She also knew she wanted to have a traditional college experience of living in a residence hall and attending sporting events on a university campus. Through a partnership between Bemidji State University and NTC, Groenhoff lives in Oak Hall on the BSU campus and attends class at NTC only a few miles down the road. 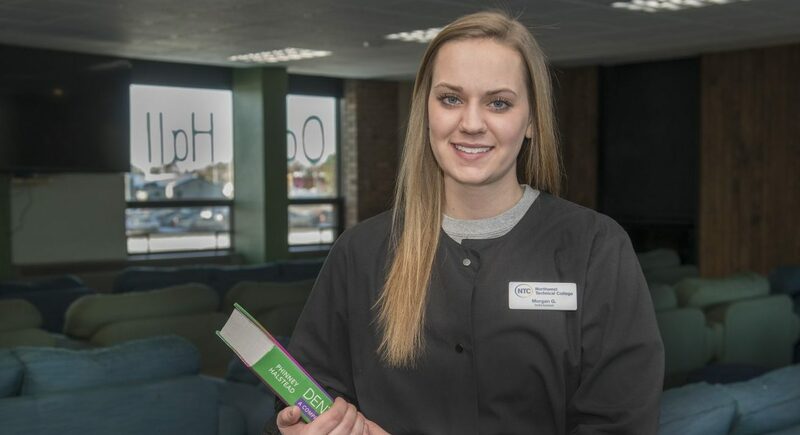 When making the decision about where to attend college, NTC emerged as the perfect fit for Groenhoff, allowing her to enroll in a quality, 45-credit dental assisting program and experience life as a traditional college freshman. In NTC’s dental assisting program, Groenhoff is learning the daily tasks, projects and expectations that a dental assistant experiences throughout their career. The diploma prepares graduates to become a chair-side dental clinicians qualified to assist dentists in a variety of dental practices or advance to an Associate of Applied Science (AAS) degree. Courses within the program focus on dental anatomy, dental radiology, dental pharmacology, dental ethics and jurisprudence and dental practice management, as well as clinical assisting. Currently, Groenhoff is studying topics ranging from from how radiology helps get clear images of a patient’s tooth to how to assist in dental procedures such as creating impressions or crowns. Groenhoff’s studies are supported by a $1,000 George W. Neilson Foundation scholarship, one of 15 2018-19, awarded by the NTC Foundation. The Neilson Foundation scholarships are funded by a grant from the foundation to support first-year NTC students like Groenhoff. With the support of NTC’s Foundation, Groenhoff is succeeding in her classes and her pursuit of a dental assisting diploma. Upon graduation, she plans to complete a dental assisting internship close to her hometown of Roseau, Minn. and then pursue a career as a dental assistant.